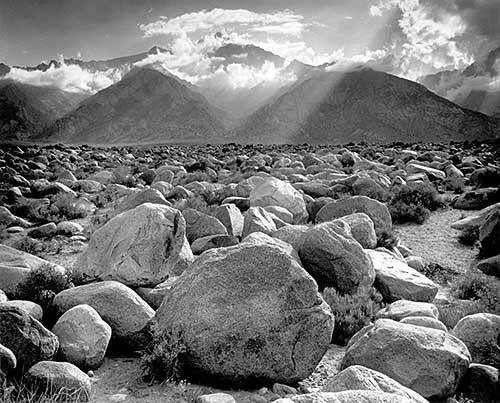 Visit the University of Notre Dame Snite Museum of Art to view four photographs by Ansel Adams from their collection, November 1, 2013 – January 12, 2014. 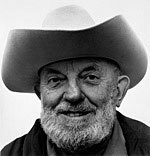 Known for his grand views of the American West, Ansel Adams (1902 – 1984) created extraordinary photographs that are among the most recognized and celebrated images of the twentieth century. This exhibition features a collection of forty-eight works, about two-thirds of a selection Adams made late in his life to serve as a succinct representation of his life’s work. He himself felt these photographs were his best. Called “The Museum Set,” these works reveal the importance Adams placed on the drama and splendor of natural environments that might not, to the ordinary passing hiker, have revealed their secrets. Included are many of Adams’ most famous and best-loved photographs which encompass the full scope of his work: elegant details of nature, architectural studies, portraits, and the breathtaking landscapes for which he is revered. The exhibition also includes this photo portrait of Ansel Adams by James Alinder. In a career that spanned more than five decades Ansel Adams became one of America’s most beloved landscape photographers and one of its more respected environmentalists. There are few artists whose name and works represent the extraordinary level of popular recognition and artistic achievement as that of Ansel Adams. Adams profoundly influenced the course of 20th century photography not only through the example of his sumptuous and technically precise images, but also by means of his personal energy and devotion to advancing the cause of photography as an art form. As an artist, educator, innovator, and writer, he helped establish many of the institutions that have come to represent the highest aspirations of the medium of photography. Also on view will be a small selection of vintage cameras and equipment on loan from Craig Sheaks and Center For History, South Bend. This exhibition was organized by the Turtle Bay Exploration Park, Redding, CA. Exhibition tour management by Landau Traveling Exhibitions, Los Angeles, CA. image: top: Mount Williamson, The Sierra Nevada, from Manzanar, California by Ansel Adams ©2013 The Ansel Adams Publishing Rights Trust. The South Bend Museum of Art’s 2012-2013 Exhibition Program is made possible, in part, with support from the Community Foundation of St. Joseph County’s ArtsEverywhere Initiative.